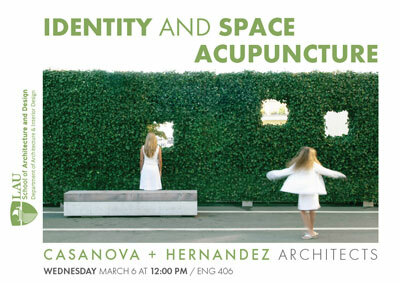 The Department of Architecture and Interior Design is hosting a lecture entitled “Identity and Space Acupuncture” conducted by Helena Casanova and Jesus Hernandez, principals of Casanova + Hernandez. Both Casanova and Hernandez were born in Madrid Spain, where they completed their studies in Architecture. They practiced in several firms in Spain and Holland before establishing their own firm in Rotterdam, in 2001. Since then, they have realized a number of projects and won several competitions, among which is a project selected for the ‘2013 World Landscape Art Exposition’ in Jinzhou, and another one “Green Windows” for the Sixth European Biennial of Landscape; in addition to First Prize for Cool Toren in Rotterdam (2010), and First prize for Zorgwoningen Blaricum in the Netherlands (2010). Their work has been also selected for several exhibitions and publications.